You wait weeks for a post, and then two come along at once. Here's a very bad photo of some lovely minis that Shaun (Redzedz) painted for me; it really doesn't do them justice (see here for better photos). 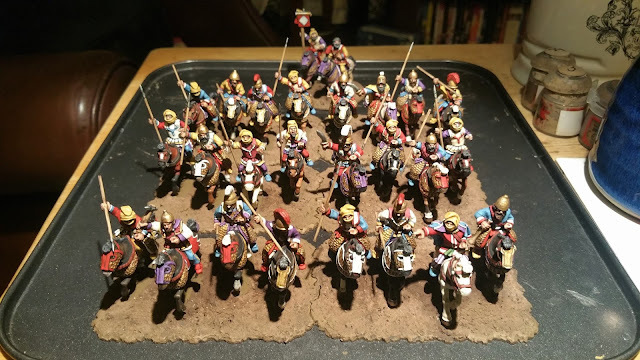 These Foundry Casting Room Persian heavy cavalry will also be in the Ipsus game at the Wargames Holiday Centre next March, in the role of Satrapal horse. I'm basing them on my irregular magnetic "Batbases" which are 19cm wide with a break in the middle (so I can easily indicate when the unit is disordered). The bases are grouted and ready for painting!